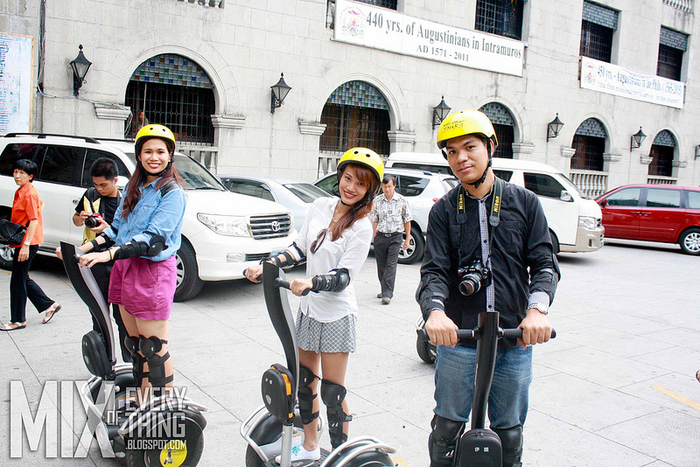 I will never get tired of touring Intramuros. The old walls hold countless stories that I would gladly hear and listen to over and over. Old Manila fascinates me... from the horrific carnage to the inevitable redemption and resilience. 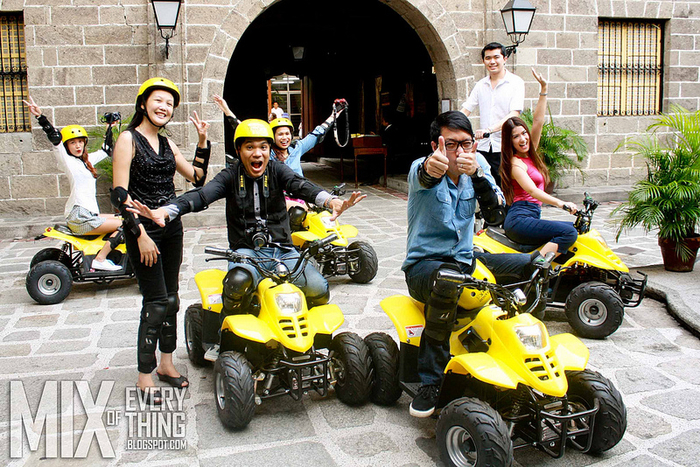 So my first official Intramuros tour (impromptu much!) happened 2 years ago when we decided to check out the vicinity na din after picking up my cheque from the Manila Bulletin office located inside the walls of Intramuros. Second time was when we joined world renowned guide, pied piper of Manila and my crush (oo inaamin ko! haha) Carlos Celdran's Walk This Way tour. It was one for the books! It was mostly centered around Rizal's life with some history on the side. We loved it. I wanted to kill myself when my SD card died on me taking with it all our tour photos. Gaaah. 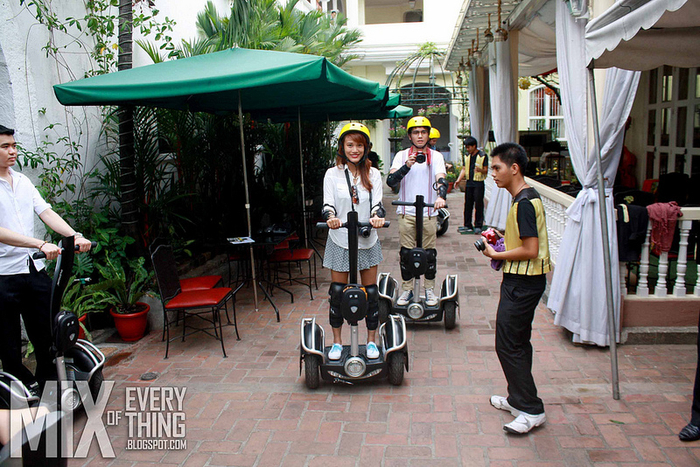 So when White Knight Hotel invited a few blogger friends to try out their Electric Chariot Intramuros tour, we said yes in a heartbeat. I've been wanting to try it out ever since I saw their long expired deal on CashCashPinoy or Ensogo ata. So bongga perfect their invitation! Thanks Janeena Chan we loves you! :) Here are photos from that day! joke lng. Elbow and knee caps muna! the forever model and forever fresh, Janeena Chan! then walang kamatayang practice until we've mastered the ride. Man vs. machine ang peg! Trying to look cool but dying inside haha. This ride might look small but it's harder than it looks! Swear. Boracay ATVs are sisiw. Super sensitive the controls. So 1 inch of pihit, 1 kilometer na andar na ganun haha. hinay hinay sila'y nagbabantay. Gwardya Sibil! kuya tour guide trying his best to get our attention. hirap makinig while riding an ATV! but then again, some good things never last. we were asked to return to our homebase and get off our ATVs. Booo. may construction worker! hahaha joke laaang. Hi Paul. So here's the real star of the show. The electric chariots! Took long before I finally got it bilang ADHD ako, so I had a hard time balancing. So chill people! Chill!!! Almost dieeeed trying to balance and trying not to fall. Haha. Nearly bumped into a pole and a plant box WTF. They had to remind me countless times to relax, chill and breathe. This ride has sensors that reads your body movements or language. So if panikera ka wala pang 5 secs plakda ka na. Haha. After mastering the art of balancing (na very easy naman sa totoo lang) on these chariots, we went to our first stop na..San Agustin Church! yes very serious sa pakikinig. Best in participation na naman. After our tour, hotel tour naman! hotel hallway. it's old but well maintained. kasama na yun sa charm nia. Standard room. Fully carpeted. Cozy din! Here's another room. Parang attic lang! Do you want to experience all this and more? Naks. Haha. Then book na! :) Click on the links below and follow them for updates:) Avail nio na yan! "This ride has sensors that reads your body movements or language. So if panikera ka wala pang 5 secs plakda ka na."